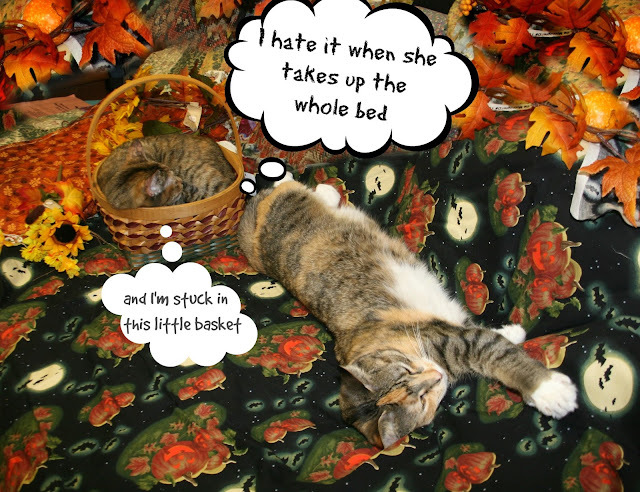 Peaches and Paprika: Which furrrball gets sprawling rights? Peaches, you're like my girl Eddy. She's the smallest furbaby in the house, 8.5 lbs of skinny little kitty, yet she takes up the most space. Talk about bed hogs, huh, Paprika?!? Well, purrs to all of you! hehehe, my peep has this problem only it is me that gets to do the sprawling and not be stuck in a basket! Such cuties! You should share. Baskets can be comfy too!! Don't you two look very autumnal! Great photo!!! OMC Now dat's a little basket ya' got there. Bless your poor little heart. Hope you bootyful girlys have a pawsum week. Big hugs fur all of ya'. I think you should get out of the basket and give her a good shove! I think you're really comfy in that basket,Paprika! Lexy and I are OK when it comes to this. She loves to squish into a basket while I stretch out. Oh you made us laugh, poor thing, I hope you got to stretch a little bit later on! Good small spaces are nice, but room to stretch out is better. Beautiful pictures!!! You look so cute. Thanks for sharing!! !